Welding cables are generally used for connecting the electrode to the welding machine. However, welding cable can be used for a variety of other applications that require exteremely flexible and durable cables with high ampacities. Welding cable is designed for use in electric arc-welding machines to power an electrode, a specially designed metal rod, that conducts a charge. 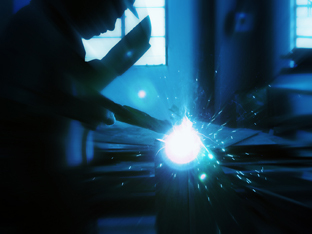 The charge carried by the electrode is needed to produce an electric arc, the heat source, between the electrode and the metals, or other materials, being welded. A durable cable is important since welding often takes place in industrial environments where abrasions, cuts, burns from sparks, and oil and water exposure can quickly wear out a weaker cable. 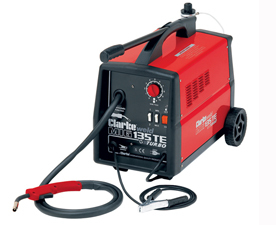 See durability of welding leads for more information. We recommend always checking with your engineer if you are planning to use welding cable for applications other than welding. See weld leads for other applications. Ampacity is short for ampere capacity. For welding cables, ampacity refers to the maximum amount of electrical current a spool of cable can conduct before advanced deterioration sets in. For more detail on ampacity, see welding cable ampacity. For power supply the question is ultimately whether your cable can handle the currents you will be running through it. Three important factors to consider when selecting cable for any power supply application are cable length, gauge, and insulation temperature rating. For other applications where cable strength is what matters, like for use with hoists or cranes, higher strength welding cables (thicker cables with higher strand counts) may be used as a cheaper alternative. See "How to select welding cable" for more information. 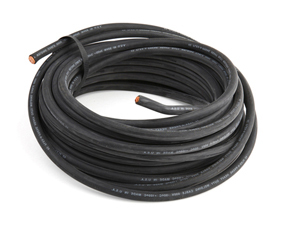 Welding cable usually comes with rubber insulation, typically either Neoprene or Ethylene Propylene Diene Monomer (EPDM) rubber, and is designed to be fire (small sparks), water, oil, and abrasion resistant. See welding cable insulation for more detail. 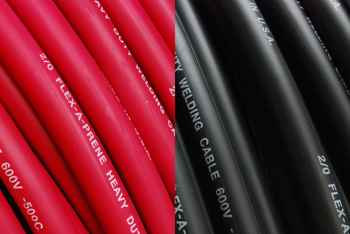 All welding cables have relatively high strand counts compared to other types of stranded cable. TEMCo's smallest welding cable, 6 AWG, has 259 individual strands of copper wire. Though there are other benefits, the primary reason for stranding in cables is to increase flexibility, and the higher the strand count the more flexible the cable will be. See stranding in weld leads for more information.